Almost 200 thousand people applied for participation in the All-Russian competition "Leaders of Russia", aimed at supporting talented managers. 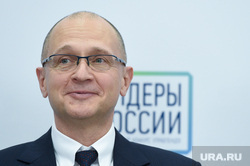 On Friday, November 10, the first deputy head of the presidential administration, Sergei Kiriyenko, announced the launch of the second stage - the online testing. Must Read: Dangerous Vulnerability Detected In India's Popular IP-Cameras 10:57 AM. "We expected that there will be a high interest [for this competition], but the real activity of people exceeded all expectations," Tass quoted Kirilenko as saying that the first test for the contestants would be to check basic knowledge of history, geography, Russian literature and subjects related to the field of law. To solve the tasks the participants are given 24 hours. Must Read: All Un-Updates Microsoft Systems Vulnerable With 48 Vulnerabilities. A day later, the contestants will wait for the next test, which will test their ability to work with information. The most complex test - on managerial potential - will take two days. Those who fail to test will receive an error report. If the test score is more than 50%, the participant will be given a certificate. Successfully passed this stage will be in the semi-finals, which will be held in the federal districts. Evaluating the contestants will be an automated complex in which the participation of a person is minimized, so that even the federal organizing committee will not be able to correct the assessment. On the start of the competition, we recall, Sergei Kirienko announced on October 11. The main goal of the project is to identify and support promising leaders from all over the country. And it's not just about managers in the sphere of civil service. To participate were invited and managers from business, state companies and the social sphere.